5,265 meals worth of food items provided through the DoorKnob Dinner Project and Let’s Do Dinner! 2,075 moms, dads, grandparents and kids currently receive food providing 30,000 meals every month with funds provided by 480 donor families. 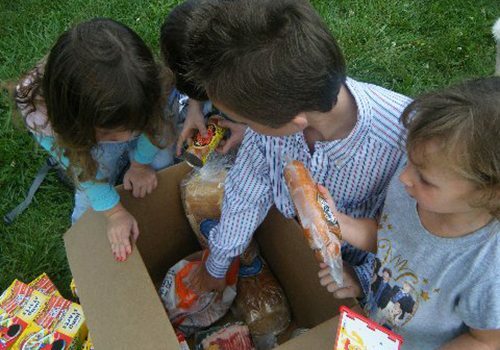 Families receiving monthly groceries come from 30 American communities in 17 U.S. states. Program operates in: Alabama, Arkansas, Florida, Illinois, Kentucky, Louisiana, Maine, Maryland, Massachusetts, Michigan, Missouri, Nevada, New Mexico, New Jersey, New York, Texas & West Virginia. Family-to-Family coordinated and provided supplies for 17 GivingWorks! events to date. Donors come from 26 U.S. states, Canada and Australia. Provided 860 “Welcome Home boxes” filled with groceries and home cleaning products to 810 families affected by Hurricane Sandy, providing over 16,200 meals for about 3,240 moms, dads, grandparents and kids. Awarded gift cards good for rebuilding materials to 100 Broad Channel families (65 families received $300 gift cards and 35 received $100 cards). Provided funds for a 2x/week Broad Channel after-school program for 50+ families so parents had time to work on repairing homes as well as lengthen their work day. Linked 700 donors with 350 families (about 1,500 moms, dads, kids) affected by the disaster. Sponsors coordinated between themselves to purchase and send the specific items (e.g. pillows, towels, dishes, pots and pans, blankets, clothing, a teapot, etc.) lost by their assigned family. Purchased 100 industrial push brooms for a “Clean-up Broad Channel” event. Purchased 300 air mattresses – 200 for Far Rockaway families and 100 for families with kids at PS 90 in Coney Island who were sleeping on the floors of neighbors and friends. Purchased items that were initially in very short supply: e.g., winter coats, pillows, bedding, space heaters, underwear, socks, personal care items, work gloves, face masks, etc., distributing them through our on-the-ground partners. Directed in-kind donations of supplies to our on-the-ground partners from hundreds of individuals and companies that contacted us wanting to donate items directly to families affected by the storm. Provided over 3,000 victims of Hurricane Sandy with a complete and fully cooked Thanksgiving dinner. Organized a holiday ornaments drive to “Light up the Rockaways” for distribution to families that lost their own decorations in the storm. Spearheaded a toy, wrapping paper, tape and ribbon drive that yielded over 2,000 toys and hundreds of rolls of wrapping paper. * We estimate the number of meals provided from non-perishable food donations to our Kids Can!, One Can at a Time and Pantry Partners programs by using USDA estimates that 1.2 lbs. is a meal for one person.